Amber Gray had surgery Thursday, July 2 to repair an injury to her left shoulder. 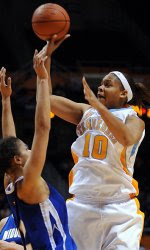 Jenny Moshak, University of Tennessee Associate Athletics Director for Sports Medicine, announced this afternoon that Lady Vol basketball rising sophomore Amber Gray had undergone successful shoulder surgery today. "Drs. Greg Mathien and Russell Betcher, UT team orthopaedists, performed surgery on Amber's left shoulder," said Moshak. "The arthroscopic surgery addressed a repair to her posterior capsule and labrum." According to Moshak, Gray's rehabilitation will begin immediately. She is expected to be fully recovered in six months. Gray, a 6-1 forward from West Chester, Ohio, injured her shoulder during a Lady Vols' post-NCAA practice session. During her freshman season, Gray played in 27 games. She averaged 2.7 ppg and 1.9 rpg in 7.6 minutes per contest.